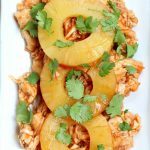 Instant Pot Hawaiian Chicken–a super fast and easy, 5-ingredient, dump and go Instant Pot recipe of slightly sweet chicken and pineapples. Serve this chicken on Hawaiian rolls or over rice. 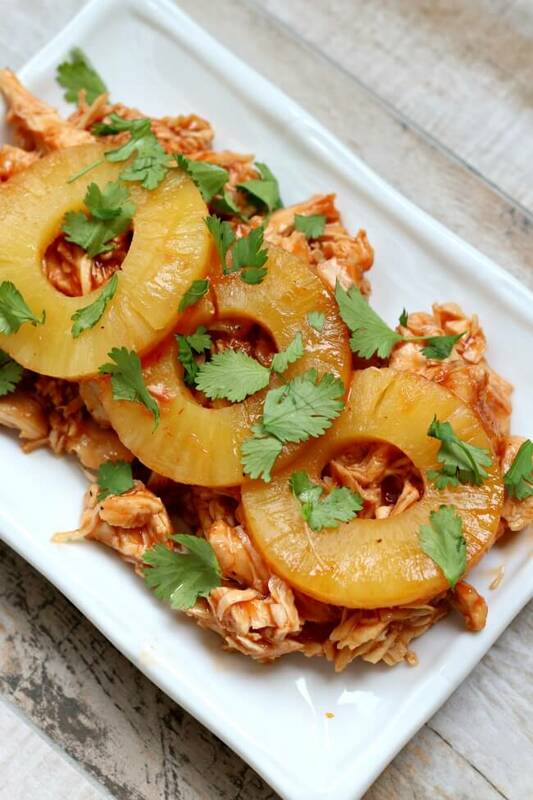 This recipe for Instant Pot Hawaiian Chicken is light and tangy and can be served over rice or on sweet Hawaiian rolls. The fact that it takes 3 minutes of prep time to get started makes it a perfect recipe for a busy weeknight. You can easily use the keep warm setting to keep the chicken warm in the Instant Pot until your family is ready to eat. You can even serve your family in shifts if needed. Just keep the buns handy and each person can serve themselves when they get home from work/school/activities. If you prefer to serve this chicken and sauce over rice then you can easily make pot-in-pot rice. If you want to know how to do that you can see the video/article here. To make Instant Pot Hawaiian Chicken I used my 6 quart Instant Pot Duo 60 7 in 1*. I love this Instant Pot because it has the yogurt making function which I use almost weekly. It has two pressure settings (high and low), and there are also little slots in the handles so that you can rest the lid there instead of putting it down on your counter-top. 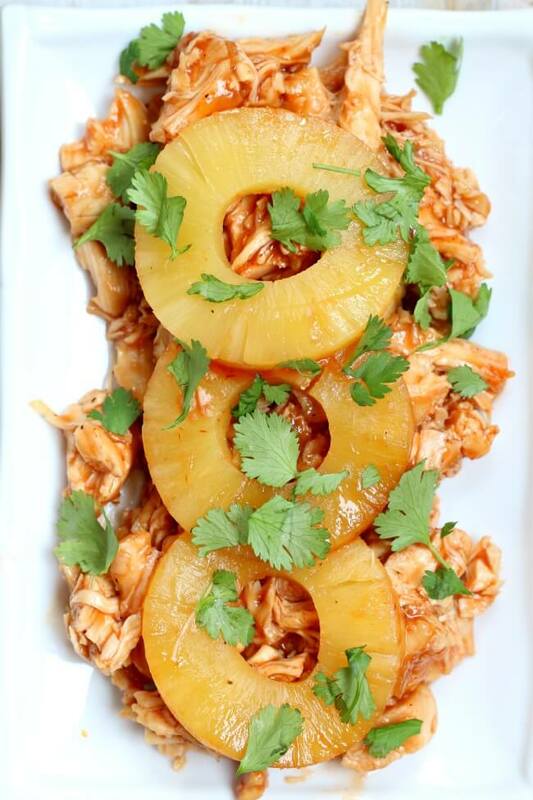 A super fast and easy, 5-ingredient, dump and go Instant Pot recipe of slightly sweet chicken and pineapples. 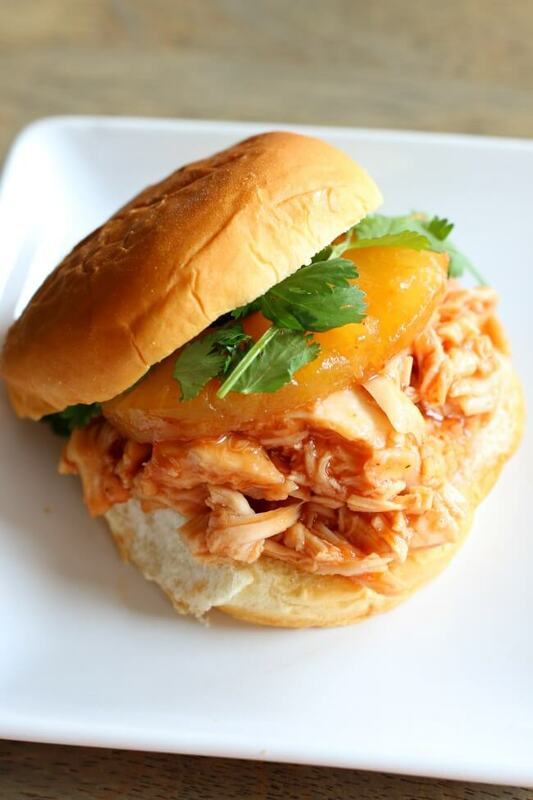 Serve this chicken on Hawaiian rolls or over rice. Pour chicken broth into bottom of Instant Pot. Place trivet in the pot. Stack the chicken breasts cross ways on top of the trivet (see this video). Baste about 1/4 cup of the bbq sauce over the chicken (save rest of sauce for later). Lightly salt and pepper the chicken. Cover the Instant Pot and secure the lid. Make sure the valve is set to sealing. Set the manual/pressure cook button to 12 minutes for fresh chicken or 15 minutes for frozen chicken. When the time is up let the pot sit there for 5 minutes (display will say L0:05). Move the valve to venting. Remove the lid. Place the chicken on a cutting board and shred*. Discard the liquid in the pot. Place chicken back into the pot. Turn the Instant Pot to the saute setting. Add in the rest of the bbq sauce, the pineapple and the cilantro. Stir. Scoop chicken onto rolls/buns or rice. Enjoy! This is a perfect recipe to make with pot-in-pot rice. I used my 6 quart Instant Pot Duo 60 7 in 1*. You can easily make this recipe in an 8 quart pot or a 3 quart pot. Keep the cooking time the same. When I first read the title I wondered if was going to be a recipe I used to make on the grill. It’s similar. I like idea of putting on sandwich! My boys and I really enjoyed it.. super easy to prepare. They told me that I’m allowed to make It again ..
You can use just the sling, don’t worry about the trivet. Awesome! My mouth had a huge smile. Glad you liked it Gail! I would add a few extra minutes for chicken thighs. I love them as well! I’d add 3 to 5 minutes. Hi Alex, I’m not familiar with jackfruit and how it would cook in the Instant Pot. I’m assuming it wouldn’t need so much pressure cooking time but I really don’t know.